The National Seafood Industry Leadership Program (NSILP) equips individuals with skills; networks and; a whole of industry perspective, giving them the opportunity to represent their industry and to make a contribution at a national level in the future. The program comprises three residential sessions over six months with participants making a commitment to undertake a significant industry project during that time. The NSILP design focuses on creating effective linkages between current leaders and participants through mentoring, industry information sessions and participation at program dinners. Fisheries Research and Development Corporation has formed a partnership with Rural Training Initiatives to design and deliver the NSILP. The NSILP is the only national seafood industry specific leadership program and was initially designed in consultation with seafood industry people through the work of the Australian Fisheries Academy and was delivered for seven years by Leading Industries. The course focuses on developing the skills that participants can apply at three levels – personal, business and industry. The NSILP also requires participants to be involved in a nationally strategic project. The content of the program ensures that participants are exposed to handling conflict, effective communication, efficient meetings, high performance team building, managing change and media training. As part of the NSILP, participants are challenged with having to develop a project concept or strategies that will help achieve not only their vision for the seafood community but their mission for the group over the six month program. 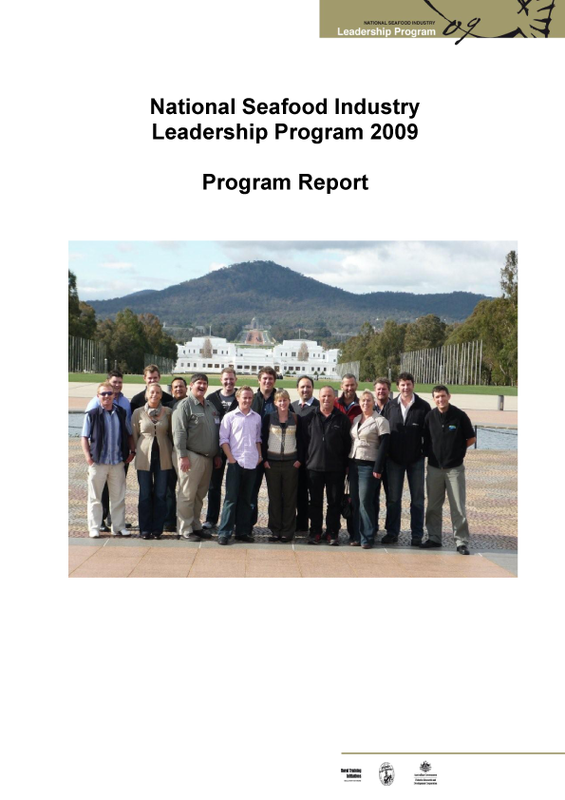 In 2009, three Australian Seafood CRC participants were involved in the NSILP: Anni Conn (Seafarm Aquaculture); Joey McKibben (Tasmanian Abalone Council) and Nick Danenberg (Seafood CRC Post-Doctoral researcher).